With the increase of new, functional high-tech appliances available for the home it is definitely no surprise that living in a high-tech home should become the order of the day. These technological developments not only make life easier through the use of practical and functional gadgets but newer upgrades in technology also promise to be eco-friendly. New advancements makes a normal home that much more intelligent and a pleasure to be in, even if it is just to fiddle with a fancy remote! However, these high-tech homes have so many practical aspects to them, which would make living in a space such as this pleasurable. Today we profile some cool aspects to these high-tech advanced homes and maybe with some inspiration you will feel the need for a upgrade to your own home! A truly high-tech home cannot be complete without the much needed cinema style media room, any movie buffs dream of course! 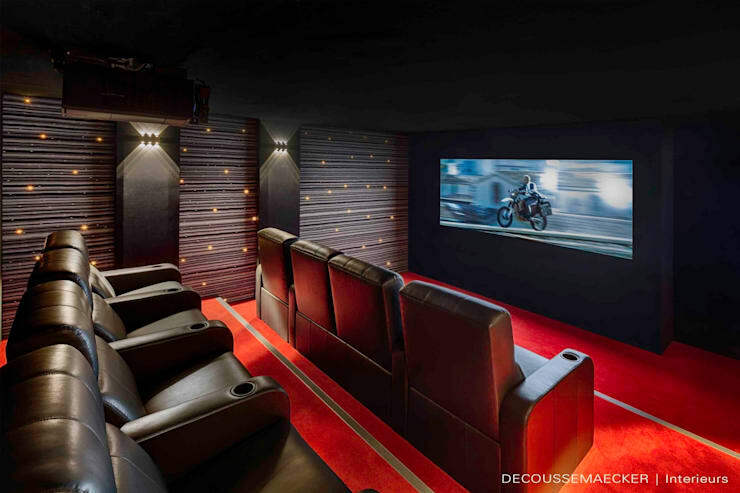 With surround sound, HD TV quality and only the best pictures, this room will make sure you never have to leave your home to enjoy a movie again. Relaxing in the comfort of your own home to enjoy a movie with your family has never been so effortless, and with the freedom of pausing the movie as you see fit, missing out parts of the movie to get refreshments will never happen again. This cinema style seating area makes for the ideal media room. 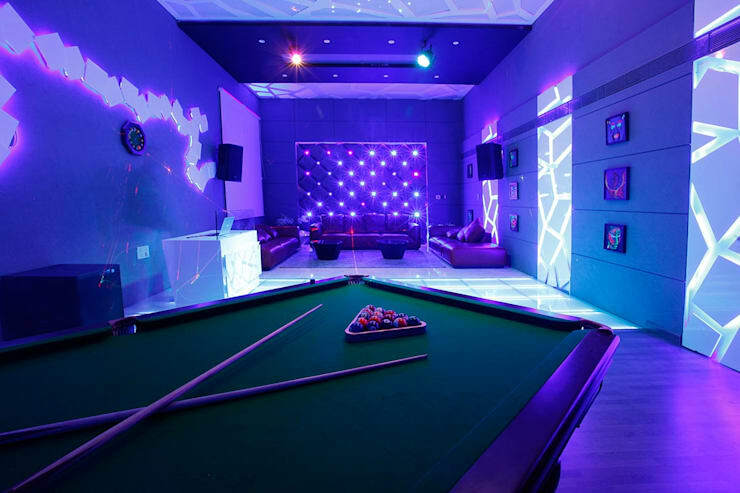 The room itself is well kitted out with cup holders at each seat for that authentic movie feeling, while the walls have been padded with soundproof material so as not to disturb the rest of the household with the background sound of an action packed movie sequence. Adding lights into a home has never been this much of a choice, with different mood lighting options and colours available that will transform a living room into a dance floor in no time with all the 1980's techno disco lights to go with it! The technological advancement that has allowed lights to be adapted to suit the event has never been so easy and can now be changed with just a quick switch on and off or can even be controlled remotely through the use of smartphone apps! The lights in the example make the perfect setting for that basement man-cave you've always wanted, allowing for a fun retro ambience to go with all the essentials for the hide-out. Add some friends, music or even a movie and some good food and you have a party. The possibilities of light colours are truly endless in this modern day and age, so pick a favourite and adapt your home to include it! Check out more great lighting ideas here! This kitchen celebrates cooking in all its glory through the use of magnificent lighting, ample storage and only the inclusion of the most prestigious high-tech appliances. This gourmet kitchen has ticked all the fabulous boxes of what high-tech pieces are most needed in a home. The sleek and modern high gloss look of this kitchen complete with boiling tap, Teppanyaki plate, extractor fan and induction hob allow for this to be a fantastic functional kitchen as well, cooking has never been this glamorous that's for sure. 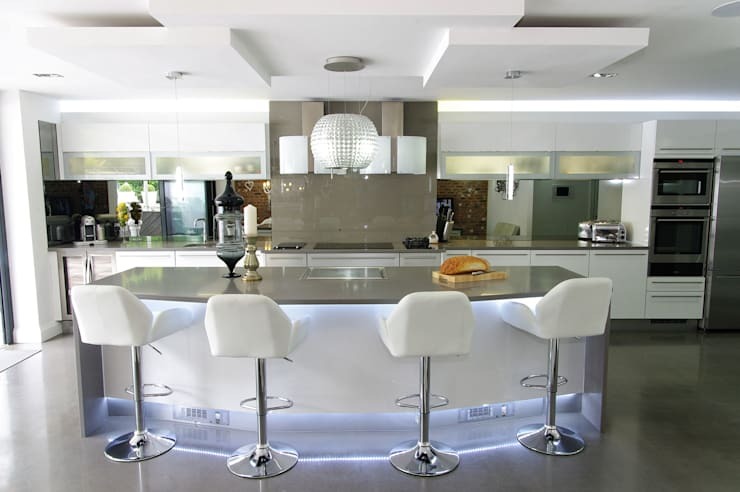 Added to all the high-tech appliances installed into this kitchen is the sleek and chic finish of the countertops and the all-white bright features, while the lights located underneath the island have a futuristic and almost space age like look, taking the high-tech feel a step further. How about the design inspiration of the sparkly light above the counter? That would certainly add an intimate feel to this kitchen. This swimming pool has a secret high-tech addition to it that will make the entire garden come alive with sounds and confusion, especially if you have guests over. How about installing hidden speakers as decoration at the pool side as a high-tech extension of the home? A pool party with speakers at the swimming pool, now that shouldn't be something to miss, or make an announcement on the intercom indoors for the kids to come inside, how about even hooking it up to the front doorbell? Never miss another surprise guest visitor. This fun and equally decorative speaker will take entertaining outdoors and surround sound to the next level, while allowing for the family to enjoy pool time with just a little more added background sound and entertainment. This high-tech ball speaker idea sounds fun right? It will also make and awesome decorative piece to the garden area. Who says technology needs to look robotic? The choice of fireplace and heating appliances available on the high-tech market are seriously boundless, with technology merging with art and decorative design to make for an even better, yet functional fireplace in a home. For years fireplaces have just been that, a place to make a fire at the wall with a mantle above it, however fireplaces such as this in the example have taken a concept as old as man, and made it that much more exciting. 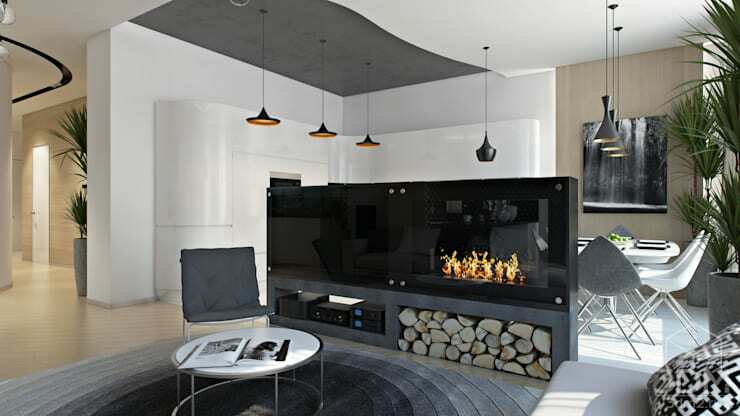 This fireplace has decorative design written all over it, with it seamless consolidation with the TV. The fireplace itself stands in the middle of the room and thereby provides heat to both sides of the space, while looking fantastic at the same time. It even has a storage facility underneath for wood, so every aspect has its place. This high-tech fireplace certainly has a degree of quality and elegance to it that makes it so much more stunning. With the advent of new technology and the increase in high-tech homes being constructed, many home owners, contractors and architects are becoming more aware of how to merge environmental friendly concepts with high-tech innovation, thereby making new homes more eco-friendly. 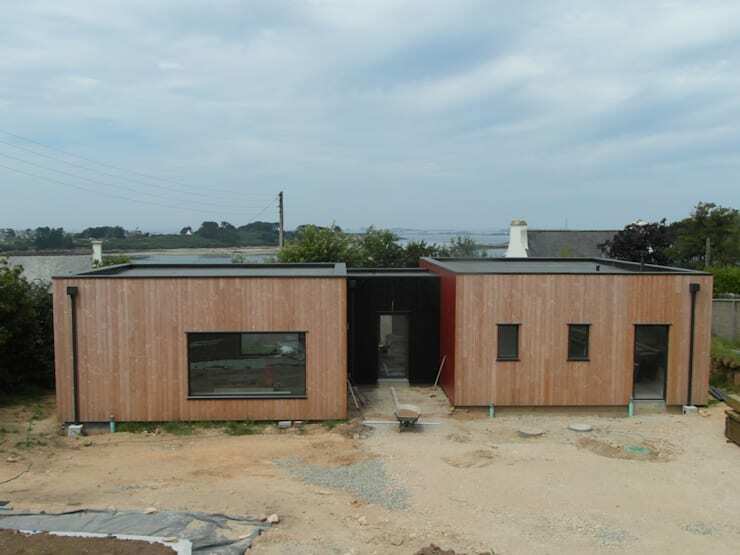 The construction of these homes use only green conscious materials, and strive for water conservation methods to be introduced into the home, while taking into consideration the existing biosphere and ecology of the terrain and include recycling or upcycling of products for the home to remain green. Using these high-tech methods and ideas to create a futuristic yet sustainable homes that will maintain the environment without interference is surely the next step for technological advancement. So while on the one hand homes are becoming gadget friendly, on the other hand people are becoming more conscious about the effects of global warming and are starting to make small changes in the home. Which would be your high-tech room?